The territory of Tennessee originally consisted of six counties--Washington, Sullivan, Greene, Davidson, Sumner, and Tennessee (later Montgomery & Robertson)--under the jurisdiction of North Carolina from 1777 to 1788. The counties requested protection from the Indians and the right to navigate the Mississippi River but North Carolina neglected these territories. 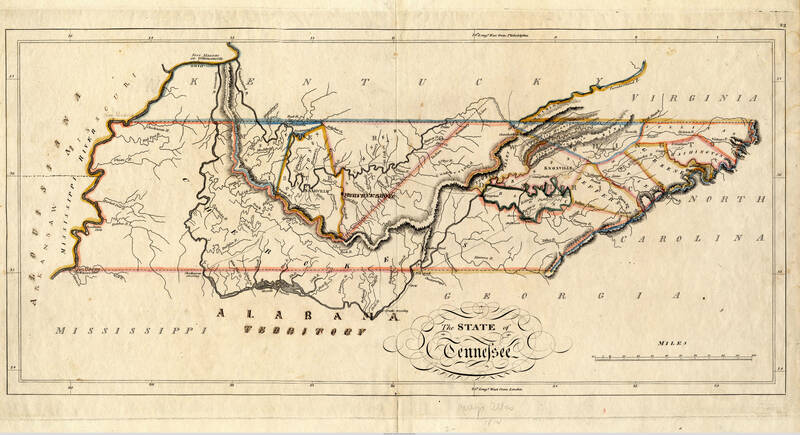 In 1784 dissatisfied East Tennesseans formed the breakaway state of Franklin, or “Frankland”, under the direction of John Sevier, the newly named governor. As North Carolinian officials discovered the territory’s attempted independence, they slowly reasserted their authority over the area. Disagreements among rival factions, coupled with the North Carolina resistance, doomed the state of Franklin, which passed out of existence in 1788. In 1789 North Carolina ratified the United States Constitution and ceded its Tennessee lands to the Federal government. This area was now designated as the “Territory of the United States, South of the River Ohio,” more commonly known as the “Southwest Territory.” The United States created three districts in the area: two for East Tennessee and the Metro District on the Cumberland. Each district had courts, militia, and office holders. William Blount governed the territory following his appointment by George Washington. Early governance of the territory focused on treaty-making and securing settlers from Indian attacks while raising land values and encouraging settlement. Between 1792 and 1794, warfare with Native tribes increased until strikes led by James Robertson and John Sevier eliminated the threat of Native raids against the East Tennessee and Cumberland settlements. In 1795 Governor Blount called for a constitutional convention in Knoxville to begin the process of joining the Union. The delegates converted the territory to a state with an organized government and constitution before applying to Congress for admission to the Union. The delegates selected John Sevier as governor, William Blount and William Cocke as senators, and Andrew Jackson as representative. Tennessee was the first Federal territory to apply for statehood to Congress. After a close vote on June 1, 1796, Tennessee became the 16th state of the Union.